Promoting your business online is very important no matter what kind of business you might be running. 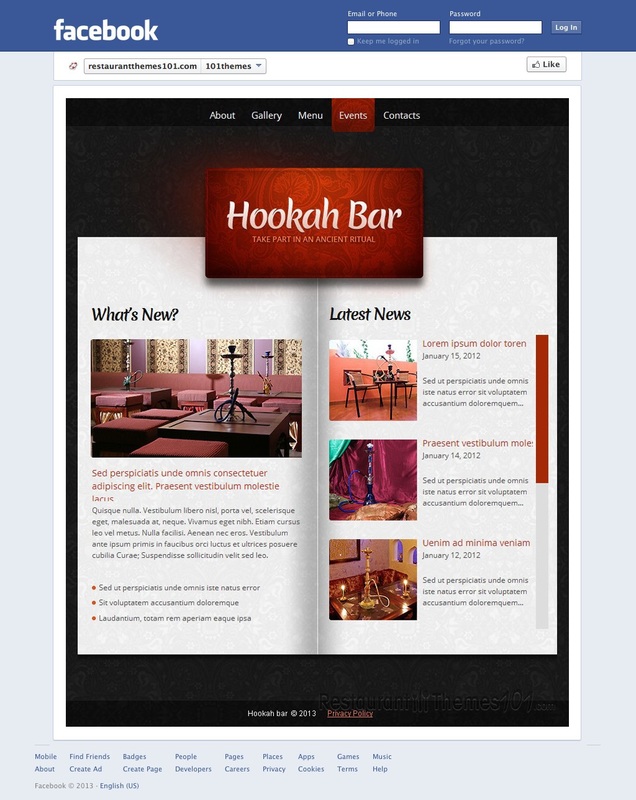 If you are a bar owner, creating a Facebook page for your business can only mean more visitors and great advertising. 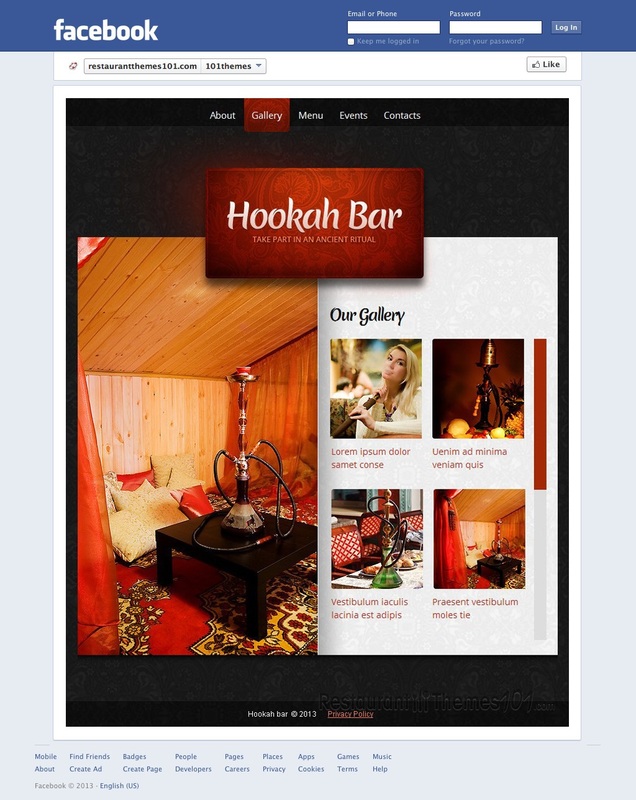 A great page is unique and interesting, and this is exactly what Hookah Bar offers to you. 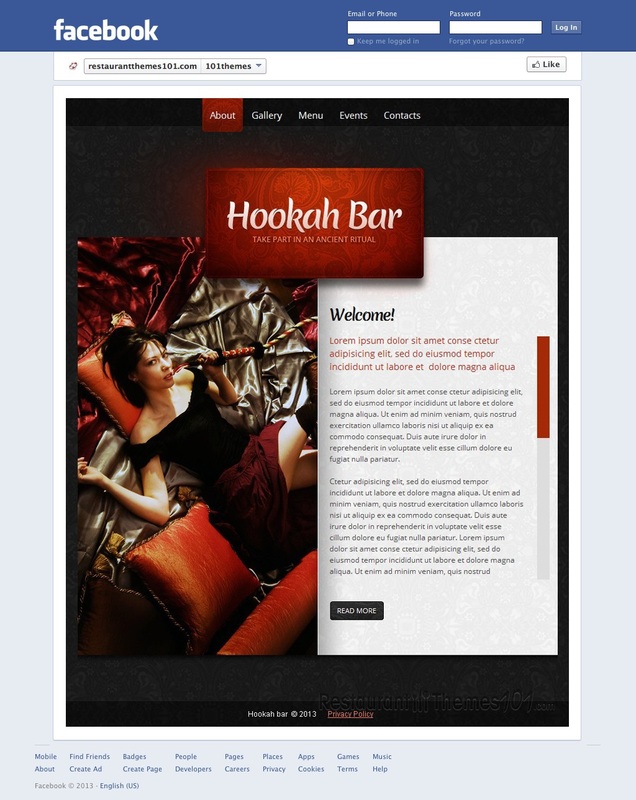 It is a Facebook cafe page template created by Mercury and featured at Template Monster. 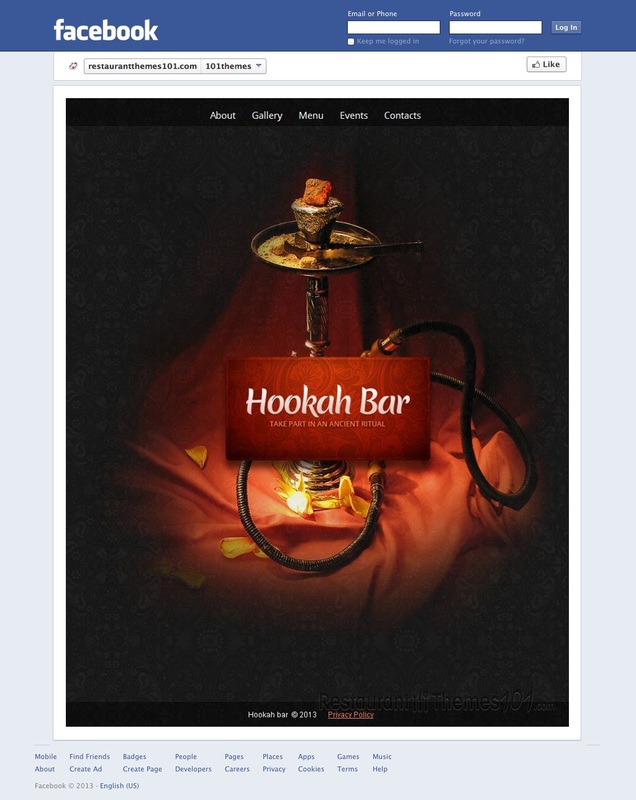 Hookah Bar features a unique style. A great looking background is across the whole front page, giving the layout a simple, classy look with its nice colors. This template features five sections and it offers a lot of content space for you to fill up with info about your services. The “about” section is reserved for a nice welcoming note where you can tell your visitors all about your restaurant in detail and make them feel pleasant and cozy. A nice photo goes along with this section. The gallery area lets you post many quality photos of your bar, or the delicious snacks you offer. They will be shown in thumbnails, and by hovering each thumbnail a large photo opens up, allowing your guests to see just how amazing things look at your bar. 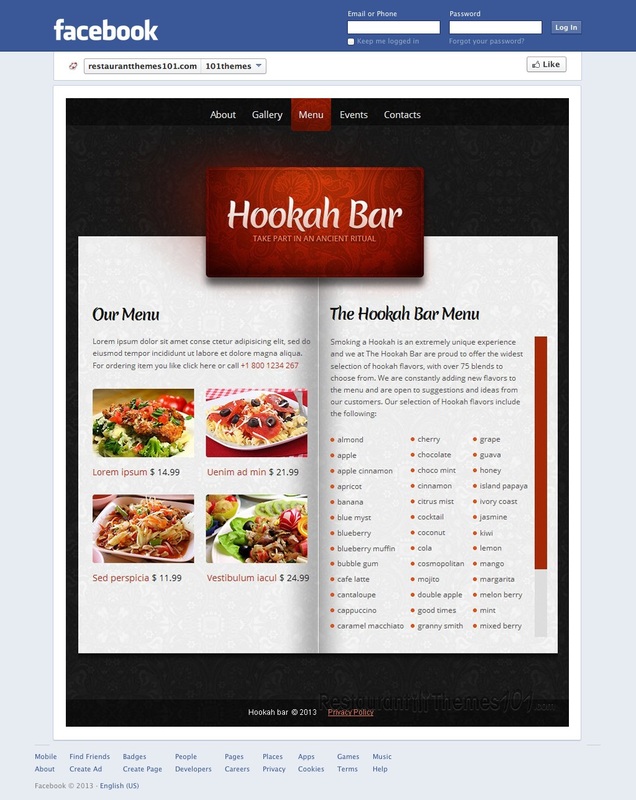 The menu of this template is really something different. You will be able to categorize it in so much detail, you will be amazed. Each menu item will have its own photo and price, and it will be very simple for your guests to find exactly what they need. There is a separate area reserved for news and events, and this is where you can post photos of previously organized events and announce new ones, keeping your guests updated at all times. A nice contact form was added to the contacts area, and there is also space for you to write own your contact details, including phone numbers, address, email, etc. 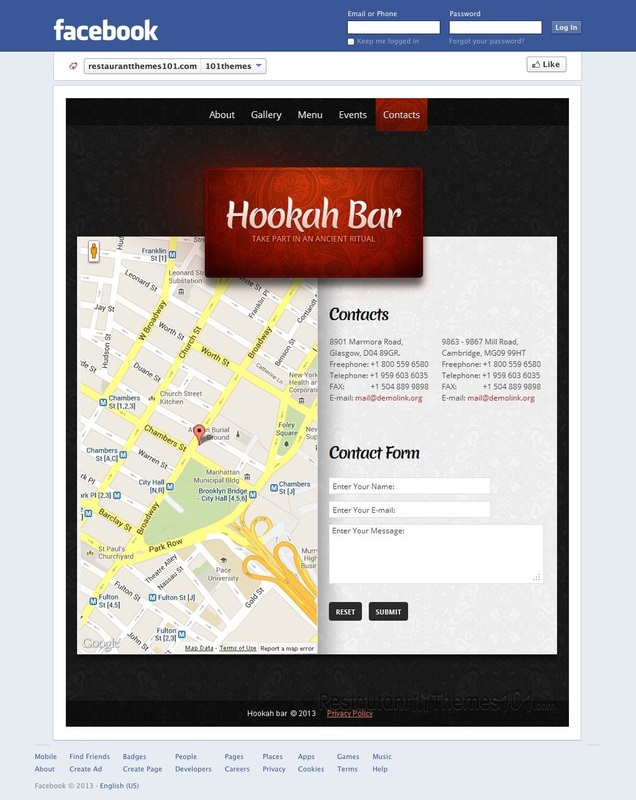 The Google Map integration featured allows your visitors to find your cafe easily and quickly.